PASP is very pleased to exhibit the works of Nikos Samartzidis collection. Samartzidis is a painter and poet and has exhibited his works in Germany and Crete. These collection pieces are works of art inscribed with Linear B on canvas, clay tablets, and compact disks. In the works, Linear B is used as a script for poetry. Works on canvas, board, clay and CD are on display at PASP. 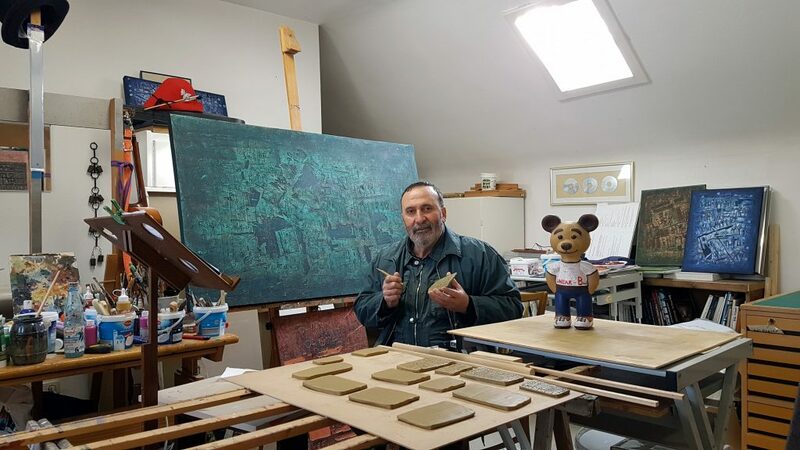 Nikos at work with clay tablets. Nikos Samartzidis, 2018. In his works, he quotes ancient poets like Hesiod and Homer and many modern Greek poets like Elytis and Cavafy. 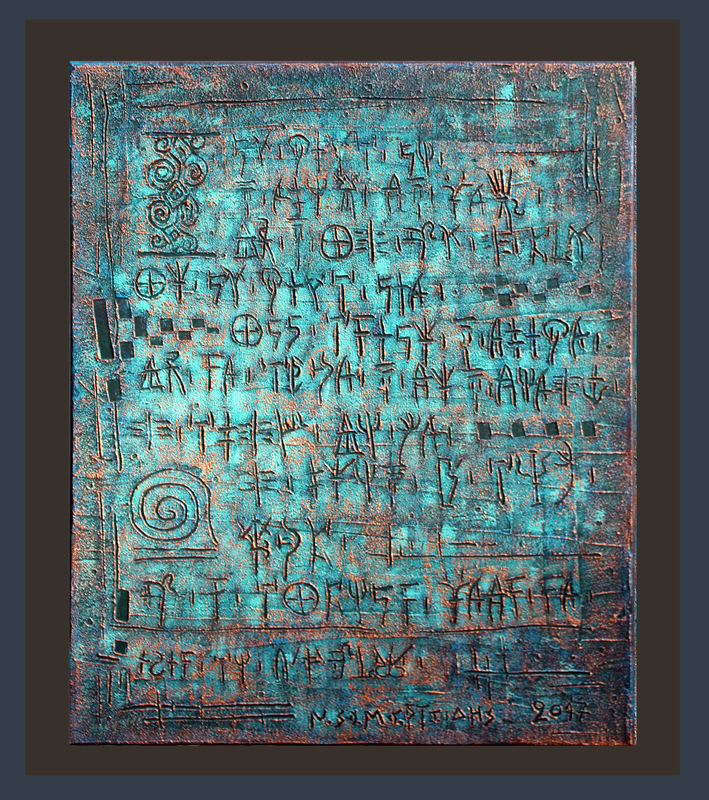 In the painting below, Dylanology II, he even transcribes the lyrics of American musician Bob Dylan into Linear B. The answer, my friend, is blowin’ in the wind. These paintings are also permanently accessible through Texas ScholarWorks (URL). Transcriptions and translations of the works are included with every entry, too. Also at PASP are clay tablets and etched CDs in Linear B and many papers of Samartzidis, like exhibit handouts, news articles covering his work, and notebook pages. More of his works can also be accessed at his website. In the near future, a digital exhibit of his works will be published on Scalar. 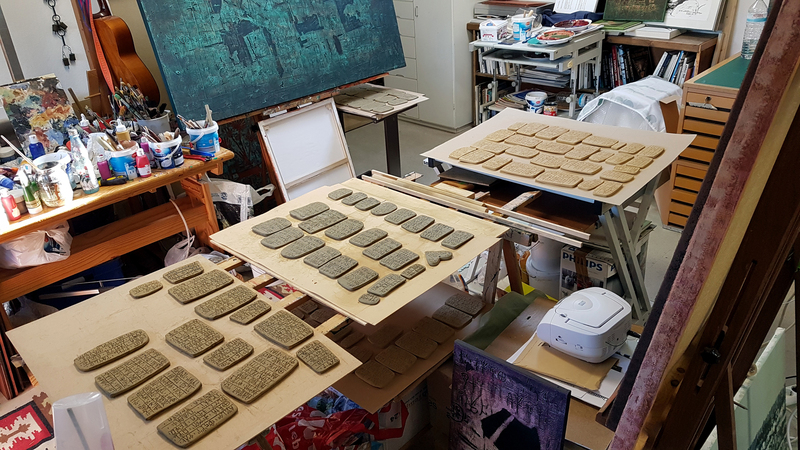 There, paintings from PASP’s Samartzidis collections will be presented with interactive transcriptions and transliterations from Linear B to Greek and English.